When I was fifteen, I spent a summer borrowing a friend's VHS tapes of subtitled Evangelion. I was ready for the robots and the boobies, but those are just light reflecting off the tip of an iceberg that was years beyond anything in animation. To this day, I wish more people ignorant to anime could digest and discuss Eva as proof that animation goes beyond Spongebob. With Evangelion: 1.0, we may yet have a chance. Hideaki Anno has rereleased his touchstone creation through three new hour-and-a-half-long movies which hope to condense the 26-episode series. How'd he do it? By adding visual but sacrificing story details. At first glance, 1.0 looks like a recap movie. But Anno and his team have put a fresh coat of computer-graphics-tasting paint over his creation, adding immense 3D graphics and details to every last nut and bolt of Nerv's HQ. Scenes with vague backgrounds have been revisited and placed in locker rooms, jazz clubs, elevator shafts, and military prep rooms, grounding viewers into paying even more attention to the dialog. Action scenes have abandoned the framing-and-flashback technique and become straight-forward fights. Angels now bleed, spark and then explode. With today's computers, Anno has added very complex lighting effects, which help create a greater contrast between domestic and action scenes. This revision of Eva is loaded with new dialogs, scenes, shots and colors which develop Shinji's story by putting every scene, at last, into a coherent context. That's right, I said coherent Eva. I know, I was surprised too! This may be the best thing to happen to Evangelion since Prozac. For the first time, the story is told chronologically and tersely. Anno's reworking of the script has eliminated the space and time disorientation that kept the original cut of Eva enigmatic. 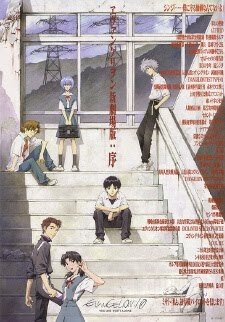 Hopefully, Evangelion 1.0 will resurrect the series for a new generation of otaku, allowing potential fans to dedicate an evening (rather than an entire semester) to watching and, more importantly, understanding Eva. On the downside, Evangelion fans may not be comfortable with the hasty pacing and Anno's choices to completely cut out fluff and humor scenes. Some of the surrealism and existentialism remains, but it does not interrupt the action or the plot. Can I get a "Hallelujah?" Story-wise, we still follow Shinij, though he remains as meek and spineless as ever. We should remember, however, that Evangelion 1.0 had one goal to establish: to focus on Shinji's fear of reaching out and taking responsibility. By the end of this first installment, you feel like he has made a valiant effort. There may yet be hope for Shinji…unless you've already seen Death and Rebirth. I think Hideaki Anno has gone back, tightened up some loose ends, edited down, and put significant thought into this terse update of his masterpiece. Congratulations.